If you have never had a Chicago-Style Italian Beef Sandwich, you are missing out. 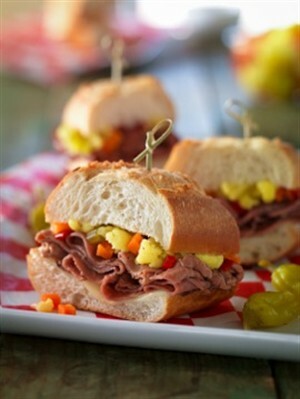 The juicy beef slices become even more flavorful with the addition of the Giardiniera broth for dipping. 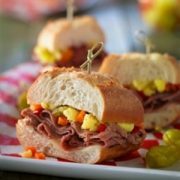 This recipe calls for roast beef slices, but I bet if you roast that beef over your BBQ grill, it will add an amazing amount of additional flavor! For Giardiniera, combine chopped vegetables, jalapeño, vinegar, oil, 3 minced garlic cloves, 1/2 teaspoon oregano, sugar, salt and pepper in medium nonreactive saucepan. Bring to a boil; reduce heat and simmer 5 to 6 minutes or until vegetables are crisp-tender, stirring occasionally. Remove from saucepan; set aside. Combine broth, remaining 3 garlic cloves and 1/2 teaspoon oregano in same saucepan. Bring to a boil; reduce heat and simmer 5 minutes to blend flavors. Remove broth from heat and immediately add roast beef; stir. Let stand 5 minutes until heated through. Drain vegetables. Drizzle 1 tablespoon broth mixture over roll bottoms. Place 1 slice cheese on bottom half of each roll. Using tongs, divide beef evenly over cheese. Top evenly with vegetables. Close sandwiches. Serve with remaining broth on the side.